Build your next Console Application Easily!. Console applications like Composer is very convienient to use because all of its dependencies is packaged inside a phar file. You can easily move around the phar file or even remove the filename extension at all, making it looks like a single executable file. Creating PHAR files before though is never easy, and this boilerplate gives you a basic structure and tools to build one. Compresses all the dependency files inside the PHAR file. You can then distribute your CLI app in any machine w/o having to use Composer to fetch its dependencies. Support for Eloquent ORM - YES!, you don't need to use Artisan console (not even Laravel ) just to use use Eloquent within your Console Application. Easy PHAR file compilation - it just takes one command to put all your source files and depedencies to one phar file : ./build.sh and that is all. Easy configuration via .env files. Love the dead simple .env files configuration of Laravel? Yes we have that here! To give you a better idea of what you can produce out of this boilerplate, you can try a simple "Hello World" phar file that you can install in your local machine. All you need is PHP installed to run the sample file. and it will produce the phar file in dist folder. 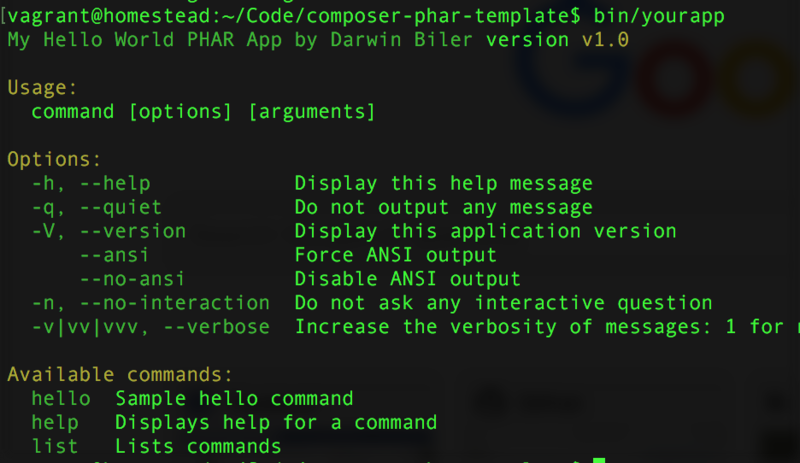 Composer-phar-template is created and maintained by Darwin Biler. This page was generated by GitHub Pages using the Cayman theme by Jason Long.